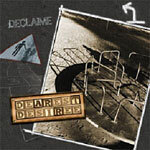 Dearest Desiree is one of the better songs to come out for a while. Wasn't feeling his past material as much as this. Declaime's new album is solid all-around! Don't forget about this B-Side with Wildchild bringin' heat as well! Side A produced by Oh No and Side B produced by Madlib.